Thought skydiving was just falling really really fast towards the ground? Think again. If you are a newly qualified Skydiver having just completed your AFF Course then the learning doesn’t have to stop there. In fact it has only just begun. Skydiving is such a diverse and exciting sport! Here are a few different skydiving disciplines to practice and specialise in… Who knows, you might even end up competing internationally and representing your home country! 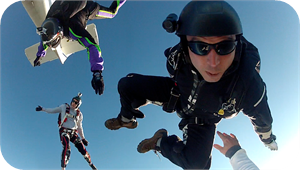 Vertical Formation Skydiving (VFS) – a subset of FS that utilises free-flying body positions (also known as VRW). Style and Accuracy – performing a predefined series of freefall manoeuvres in the least amount of time, and then landing your parachute as close as possible to a target. Freestyle – combines the dynamics of gymnastics with the elegance of dance in an aerial performance. The freestylist executes precise acrobatic manoeuvres (including loops, twists, poses and spins) while a camera moves in close coordination with the freestylist to capture the whole routine on video, and therefore provide a means to display it to audiences on the ground. Wingsuit – skydiving with a suit which provides extra lift; with bird-like wings attached between the arms and torso, and also legs. Canopy Formation – making formations with other parachutists while under canopies, also known as Canopy Relative Work (CRW) or “Crew”. Canopy Piloting – also known as “Swooping”, involving the flight of a high-performance canopy diving towards the earth at extremely high speeds, then levelling off the dive while maintaining maximum speed in order to get maximum distance and time in a very fast, very close glide across the ground. So tell me, what kind of flyer are you? Come and join us in Euroa! 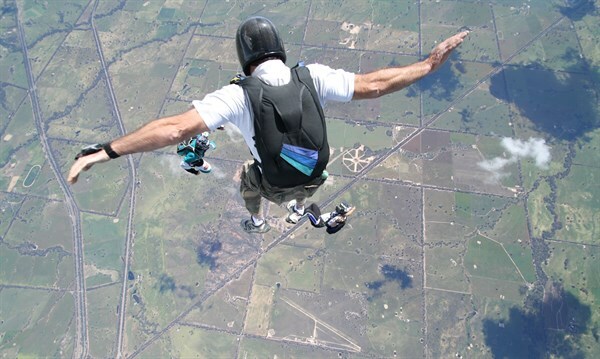 You wont ever want to go skydiving in Melbourne ever again.What are you waiting for? Pick up the phone and call 03 9432 2419 for further information on specialised training packages. Skydive Melbourne? Skydive Euroa! Yahooooo!